So, I pin those wonderful images. But what happens in my preschool classroom is not always what Pinterest shows me. Sometimes, what happens in my classroom is a far cry from that beautifully set up science and math center I was aiming for. So sometimes I feel let down by Pinterest. But let me be completely honest here: It’s not Pinterest, it’s me. 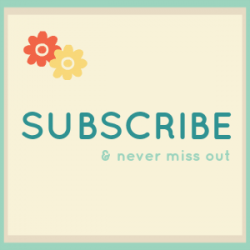 I have a student in my preschool class who has difficulty understanding the appropriate way to use the toys and manipulatives in my classroom. He’s the kid who will take the counting bears from the Learning Resources Baby Bear Balance Set in the math center over to the kitchen area to make “bear soup,” stirring those plastic counting bears until they are dizzy, making a terribly loud racket while doing so. This is not always a bad thing. In fact, I encourage my preschoolers to have a little ingenuity when using toys. But without fail, the stirring gets too animated. He stirs and stirs and stirs, all the while not only making such a terrible racket that the preschoolers playing house can’t put their baby dolls to sleep, but also spinning the bears until they begin to fly out like overflowing popcorn. Which gives him another great idea. So he abandons what left of his bear soup and picks up as many counting bears his little hands can possibly fit. And he shakes them. He shakes and shakes and shakes until his hands are let loose and little plastic counting bears are flying all over my classroom! “Bouncing bears, bouncing bears!” he calls out joyfully. But this will not do. 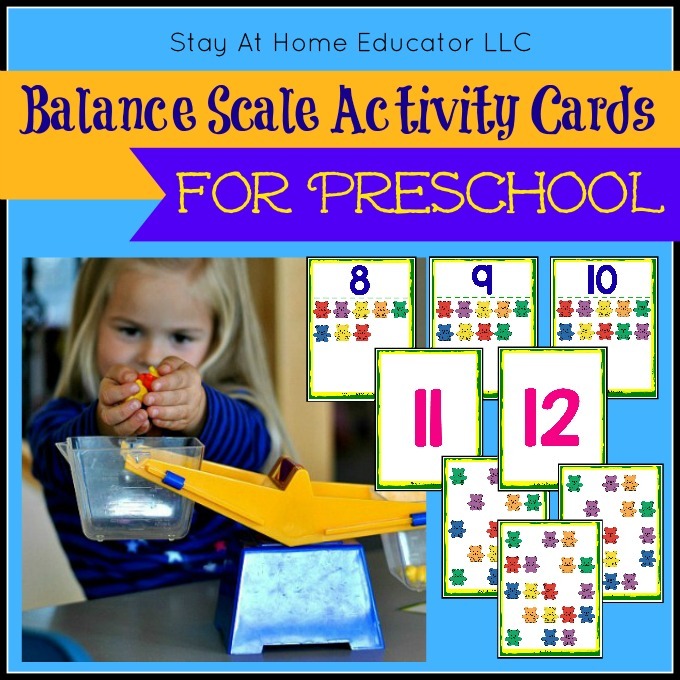 Clearly, simply having the balancing scale and counting bears set out in a math center like Pinterest shows me is not enough direction for all my preschoolers. Some need something more task oriented and concrete. 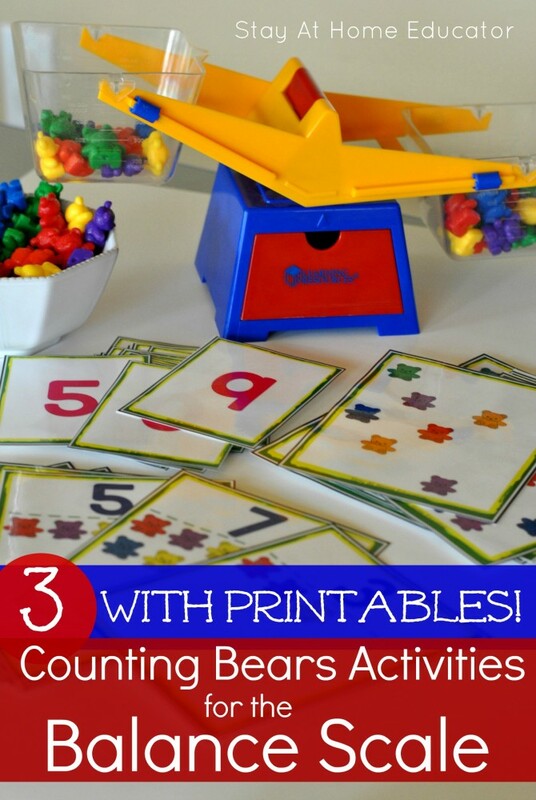 And that is exactly why I created some counting bears printables to pair with my balancing scale. So I could create some concrete and task oriented balancing scale activities that some of my preschoolers obviously need. Because my math and science center is not always (ahem, ever?) like those I see on Pinterest. Best of all, there are three levels of difficulty included. The first activity looks like a basic set of counting cards where the numeral is at the top and the correlating quantity is underneath. 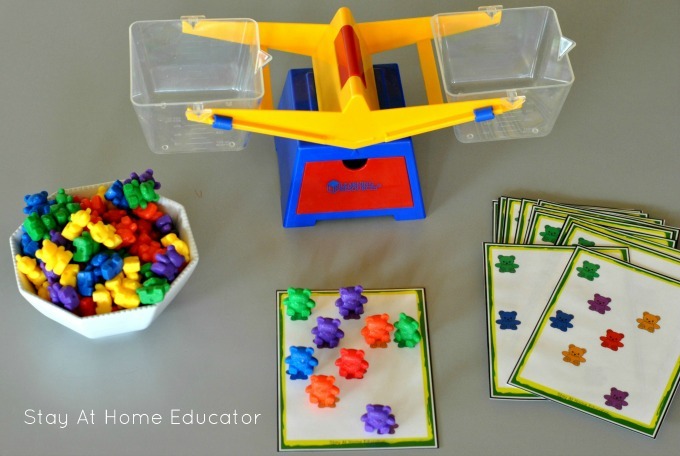 The counting bears are organized like traditional counting cards so that your preschooler can easily see the differences in quantity on each card. 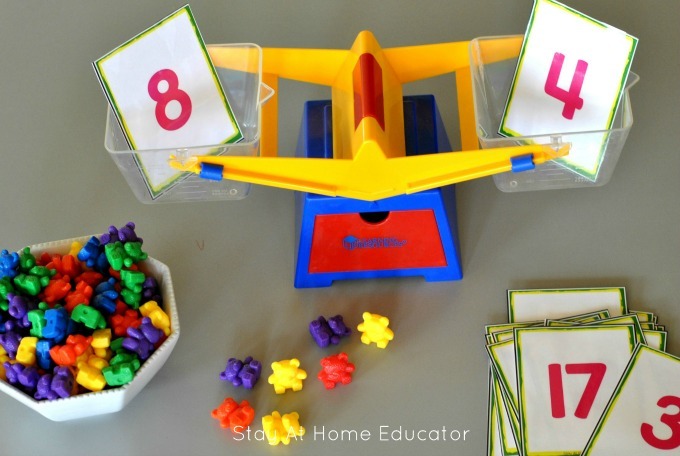 Start by having your preschooler use the plastic counting bears to count out the total on the card. Above, my daughter is placing a counting bear on top of each one printed onto the card. This helps her refine her one to one correspondence skills, as well as develop relationships in quantity. Increasing in difficulty, the second activity is simply a set of number cards. Once your preschooler had mastered counting with one to one correspondence, she can start using these numeral cards. Invite your preschooler to draw a card and count out the corresponding number of bears. Drop those bears into one side of the scale. Place the number card under the bin with the bears. Draw a second card and decide if the number is more or less than the first card. 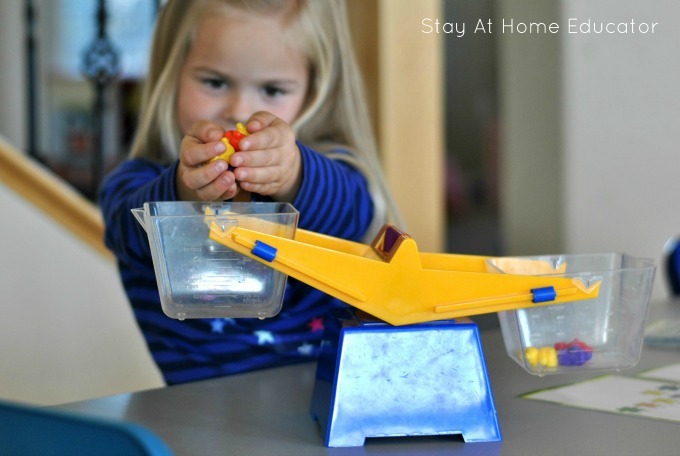 The preschooler then checks her work by counting out the corresponding number of bears and dropping them into the second bin on the balancing scale. Place the second number card under the second bin. Finally, she uses the balance scale itself to confirm which number is greater. 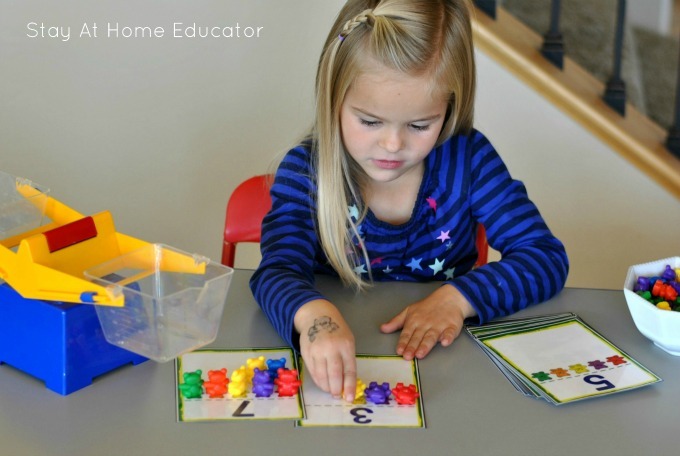 The final activity is the most challenging, but perfect for preschoolers (and kinders) who have mastered both their one to one correspondence skills as well as number identification skills. The last set of counting bear cards has only the quantity printed, with no corresponding number. The bears are also place randomly on the card, so that they have to be counted. Invite your preschooler to count the bears on the card by placing a plastic counting bear on each bear on the card. Once the counting has been done, have your preschooler identify which numeral card matches, (if you choose). Drop the bears into a bin. Follow the same steps for the second bin. Which bin has more bears? 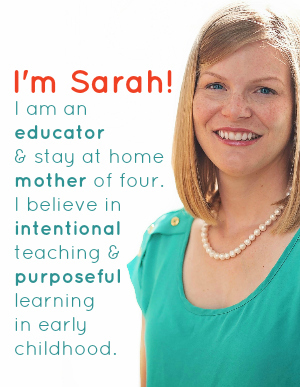 To get your own copy of these printables, designed specifically to reinforce one to one correspondence skills, number identification and weight measurement, you can purchase them directly from Stay At Home Educator Store by clicking here, or click here to purchase from my Teachers Pay Teachers store! This printable also makes a great addition to my preschool math lesson plans. 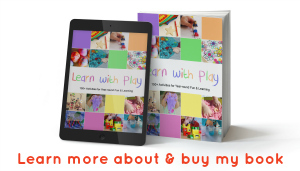 You can purchase the entire bundle of preschool math lesson plans here. 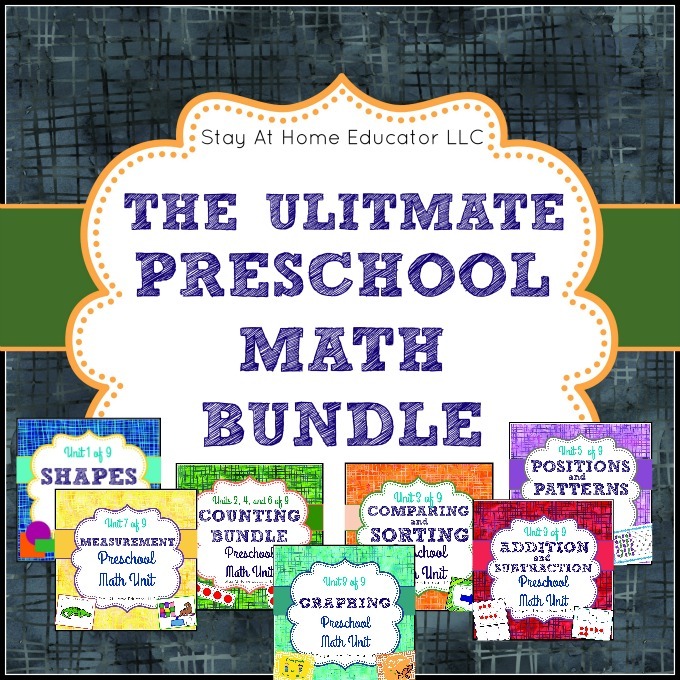 This bundle includes over 70 math centers, 36 weeks of complete lesson plans and a literacy component for each lesson! 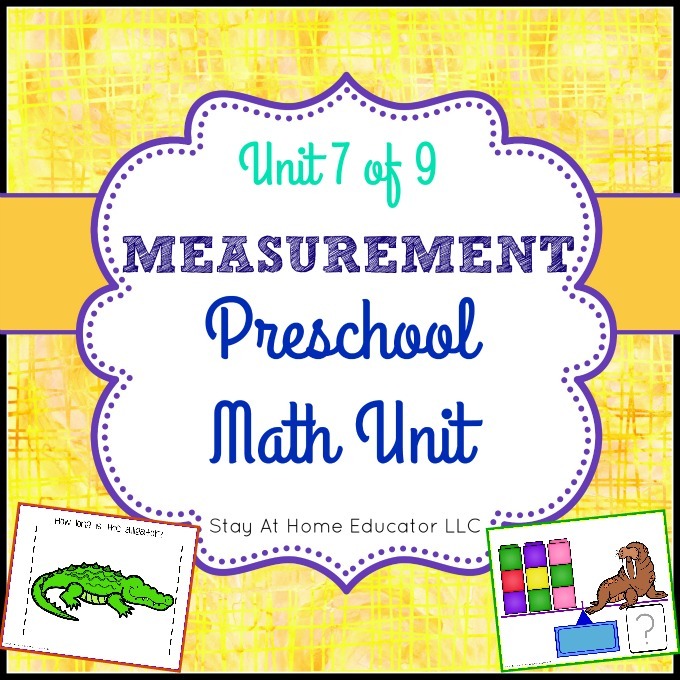 Or, try out just our measurement unit here! « Science Investigation: What is Yeast’s Favorite Food?